We learned of Argentina through my father’s accent-heavy love stories—tellings of soccer games, chants that became lullabies, noise, fights, camaraderie, intense rivalries and the legendary players who made it all worthwhile: Palmita, Maradona, Kempes. Their photographs were plastered to our walls. We found out about my father’s culture through his descriptions of the cancha (field), the sweet smell of chorizo (sausage), the blue and yellow that represented his home team, Rosario Central. What he didn’t speak of was the restless political ambiance and wavering economy. He, like most other Argentines, spoke only about what he was most certain, of what he could always be proud. My grandparents live in Rosario, Argentina’s third-largest city, a five-hour drive from Buenos Aires. On our sporadic visits, we’d go to Rosario Central’s stadium. At our first game, Rosario Central played Banfield. It was an ordinary night — no championship trophy, no major rivalry — yet the stadium filled with loyal fans, their voices ricocheting off the thick concrete walls. I can’t believe we’re here, shouted my little brother, who was nine. At these games, the Argentine culture that surged through us was realized, and my father’s stories became palpable. We came closer to understanding the fanaticism, as the energy thudded within us. Thousands of arms pumped the air in unison. Scraps of paper littered the sky and fell like confetti. Blue and yellow streamers fluttered as they sailed through the porous air. Smoke of the same colors billowed, dense within the thick walls of the stadium, which seats 45,000 but fills with 55,000. Rosario’s rivals, Newell’s Old Boys, wear red and black; their fans are known as lepers. Even before I understood the passionate relationship my father has with soccer, I learned to hate the pairing of red and black. 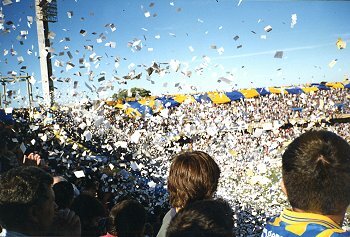 This rivalry is not as well known as that of Boca Juniors and River Plate of Buenos Aires, but that doesn’t lessen the violence that occurs — the children beaten for wearing the wrong colors, the men insulted for being born on the wrong block. Just behind the goals are the popular sections, for holders of the cheapest tickets: one side for the home team fans, the other for the visitors, the separation meant to keep fighting to a minimum. There are no blue plastic seats to stand on, no armrests to break. Standing room gives the young men who preside there freedom to move. Tall fences separate the hungry crowd from the field. Though there is also a mucky thirty-foot moat, to prevent fans from charging the players, the occasional fan still tests his abilities, and falls within its murkiness. My younger brothers and I were never allowed to venture to these spots. Muy peligroso, my father would mutter. Too dangerous. He feared that we were not savvy enough, had not been born with the ravenous hunger for victory necessary to last. So we watched from the seats for families and children, choking down our sausage sandwiches. Yet the energy emanating from the popular sustained us. That’s where the chants started, and filled the stadium. These were the songs we learned as children, before we knew their meaning. We jumped too, and sang words that finally made sense to us. The players passed the ball back and forth with Argentine finesse. With each pass, the crowd shouted ole! When Central’s DaSilva scored a goal in the second half, the crowd went crazy. The drums got louder, pierced by the sounds of whistles. Then the flags were released, draping lengthwise over two entire sections of the stadium. The blue and yellow striped fabric was passed from one row to the next, until we were all beneath it, jumping and punching the taut cloth, which from the popular must have looked like thousands of beating hearts. In those moments I realized why people fought, and on rare occasion died, for this sport. The most brutal soccer riot took place in Lima, Peru, on May 24, 1964, in an Olympic qualifying game between Peru and Argentina. In the final two minutes of the game, the referee disallowed a Peruvian goal, a call that resulted in 318 deaths, 1,000 injuries, and the declaration of martial law in the capital. Such incidents are of course not peculiar to South America: soccer riots have killed 20 in Libya, 73 in Nepal, 95 in England. Argentina may have an unstable economy, and the occasional government corruption scandal that strips the people of work. Yet soccer, a poor man’s sport accessible to everyone, endures. “Unlike in America, soccer ties into Argentina's political past," Deana Becker wrote in the international studies magazine Abroad View. During Argentina's military dictatorship, from 1977 to 1983, Argentina hosted and won the 1978 World Cup, she noted. "As the government was kidnapping and torturing its own people, Argentines rallied around their soccer team. Victory made the state seem united, even while the generals pursued a war against the people.” I agree that it's a way of life that unites more than it destroys.